Seriously, who can be arsed making mayo the tedious cheffy way books tell you, by whisking in drop by drop of oil? Not this little black duck that’s for shizzle. I’ve got things to do, people to see, Game of Thrones to watch. 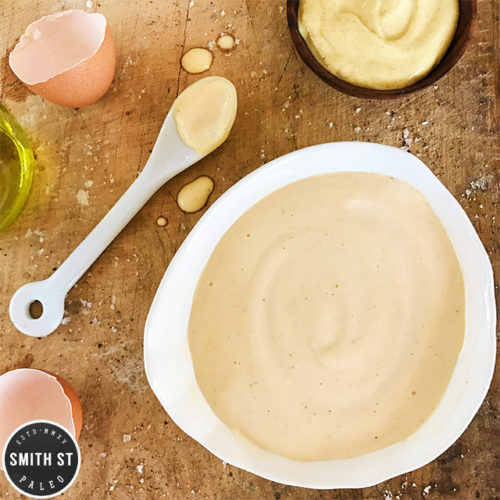 This here mayo is whipped up in seconds using a stick blender and a jar. So freaking quick and easy! I must stress on the oil though, it HAS to be a light oil, or else it’s just going to taste too heavy and overpowering (I found this out the hard way and wasted a lot of extra virgin olive oil in the process). I managed to find a ‘light’ olive oil. It was light in texture, colour and taste and worked perfectly. I live in Dubai, so when I get all Jon Snow and say winter is coming, I mean it’s BBQ season, and that calls for mayo, so get involved. This recipe works when you use a tall-ish vessel with a opening large enough for a stick blender, and the stick blender can reach the base of the vessel. I used a wide-mouthed mason jar (12 ounce size). Crack the egg into the jar along with the extra yolk. Add the mustard, vinegar and salt and pepper. Pour the oil on top, then let the eggs resettle on the bottom. Gentle put in your stick blender all the way to the base. Turn it on, but don’t move it from their base. After a matter of seconds you should see .the mayo start emulsifying. After 10-15 seconds, slowly move the running stick blender up so the last bits of oil get incorporated. *if you don’t have a mason jar, maybe you could try the glass insert to your cafetière or maybe a protein shaker bottle?